There are five regular polyhedra. They are the tetrahedron, cube, octahedron, dodecahedron, and icosahedron. The tetrahedron is composed of four equilateral triangles. 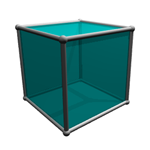 The cube is composed of six squares. The octahedron is composed of eight equilateral triangles. The dodecahedron is composed of twelve pentagons. 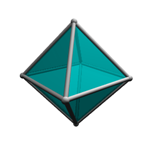 The icosahedron is composed of twenty equilateral triangles.